"Phenomenal. What incredible education value. This is the best 'green' project we've seen. A real exemplar; it's the right thing to do to bring kids into daily contact with something that really functions. We can easily imagine other schools replicating this." 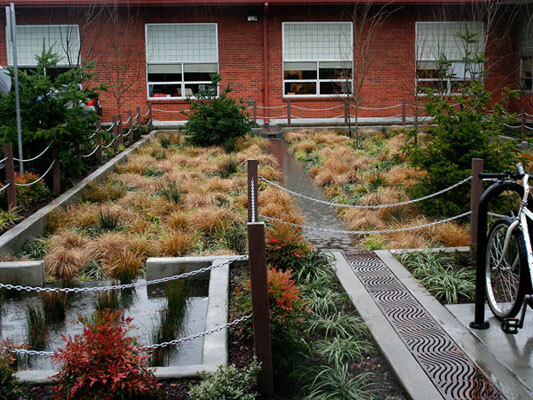 The Mount Tabor Middle School Rain Garden is regarded as one of Portland’s most successful examples of sustainable stormwater management. This project transformed an underutilized asphalt parking area into an innovative rain garden that melds the concepts of art, education, and ecological function. 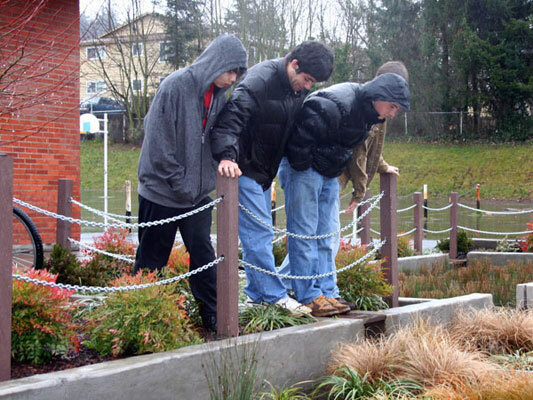 Built in the summer of 2006, the Mount Tabor Middle School Rain Garden has not only turned a “gray space” into a “green space”, but it is also helping solve the local neighborhood’s combined sewer infrastructure problems. The Mount Tabor Middle School Rain Garden project is unique to Portland and the United States in the way this schoolyard has been transformed to sustainably manage stormwater runoff. The project demonstrates the City of Portland’s commitment to promote a more natural approach to stormwater management, and many regard this “urban rain garden” project as one of Portland’s most successful stormwater management retrofit projects to date. In a collaborative effort between the City of Portland and Portland Public Schools, the Mount Tabor Middle School Rain Garden project converts what was previously 4,000 square feet of underutilized asphalt parking area abutting the school’s courtyard entrance into an innovative rain garden designed to capture, slow, cleanse, and infiltrate nearly an acre of the school’s runoff. Prior to the rain garden’s installation, the students and staff described the parking lot courtyard space immediately adjacent to their classrooms as an “asphalt oven”. Even on the mildest of days, the heat generated from the asphalt parking lot would send the temperature within their classrooms soaring. After a careful site analysis, the design team recognized several inefficiencies in the layout of the parking lot. By reorganizing the courtyard space, the design team was able to provide sufficient room for a 2,000 square foot rain garden and an entry plaza with bike parking and student seating, while maintaining adequate parking for school staff. What is particularly unique about this rain garden project is that it is first of several stormwater retrofit projects specifically designed at Mount Tabor Middle School to help solve a chronic neighborhood problem of local basement flooding. It is important to understand this context in order to help gauge the success of the rain garden project. The 80-year old combined sewer pipes serving the Mount Tabor neighborhood are inadequately sized to effectively manage the amount of impervious area runoff generated from neighborhood buildings, streets, and parking lots. During intense rainfall events, the overload of stormwater entering the neighborhood combined sewer system will “push” sewer water back into the basements of local residences. The City of Portland, dedicated to solving this problem, began working with Portland Public Schools to reduce, as much as possible, the amount of stormwater entering the combined sewer system from Mount Tabor Middle School. After several months of planning, the design team developed a multi-phased plan to retrofit the entire school footprint with landscape stormwater facilities- the rain garden being the first improvement. 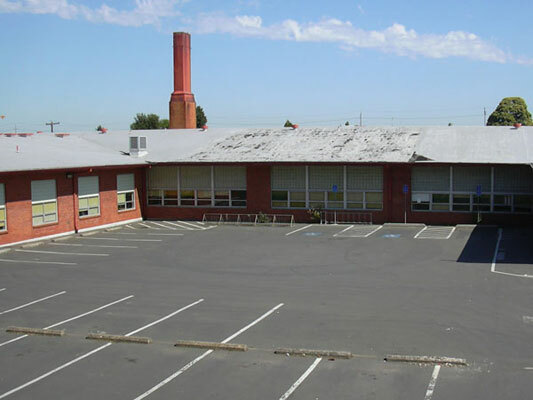 During the summer of 2006, after only 59 days of construction, the parking lot courtyard space was completely transformed from a “gray space” into a “green space” that manages stormwater, helps cool the school’s south-facing classrooms, and provides a canvas for environmental education for the students, staff, and overall community. 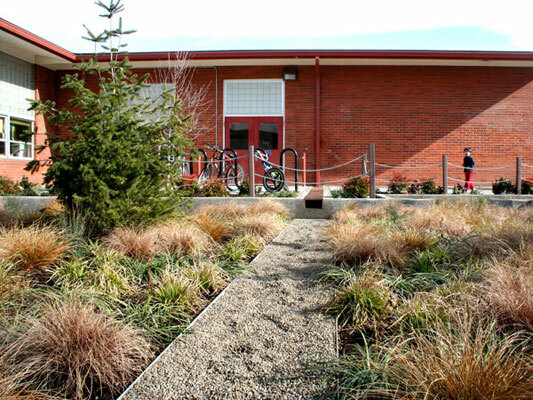 As a model for sustainable stormwater design, the Mount Tabor Middle School Rain Garden’s simple and cost-effective design demonstrates how stormwater management can be aesthetically integrated into urbanized space, provide direct environmental benefits, and act as a community amenity. 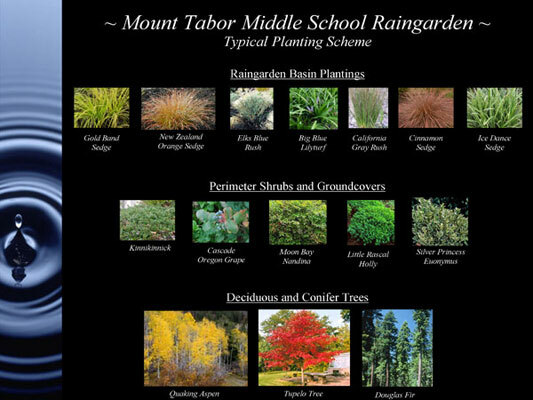 How Does The Mount Tabor Rain Garden Work? 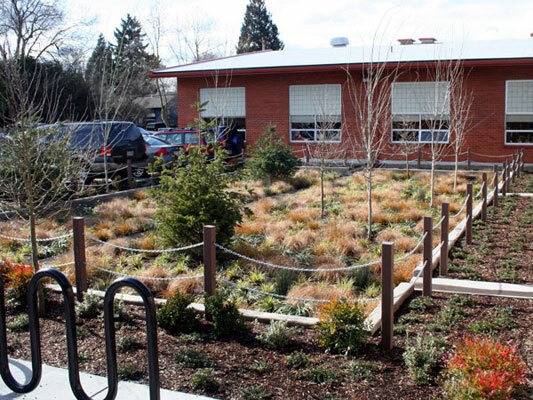 The Mount Tabor Middle School Rain Garden project essentially disconnects a portion of the school’s stormwater runoff from the neighborhood’s combined sewer system and manages it on-site using a landscape approach. 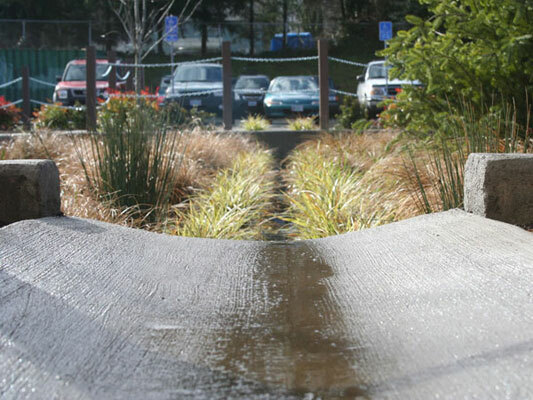 Approximately 30,000 square feet of impervious area runoff generated by the school’s asphalt play area, parking lot, and rooftops, is elegantly captured and conveyed into the rain garden via a series of trench drains and concrete runnels. Once inside the landscape space, the water is allowed to interact with both plants and soil while soaking into the ground. Depending on how intense a particular storm event is, runoff will rise within the rain garden until it has reached the 8-inch design depth. Once exceeding capacity, the water exits the landscape system and enters the combined sewer system. 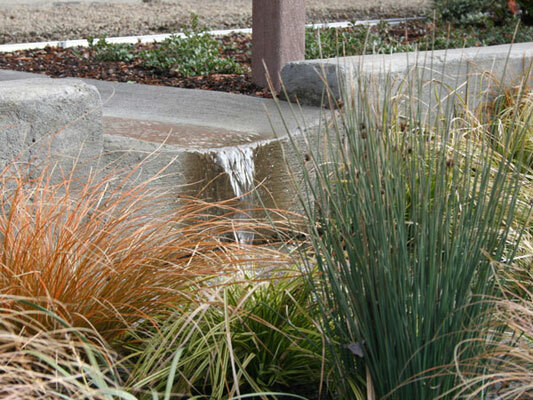 The rain garden’s infiltration rate varies from 2-4 inches per hour, meaning that any runoff that is retained in the rain garden is completely gone within a couple of hours. Since its completion in September 2006, the Mount Tabor Middle School Rain Garden’s performance has been very impressive. All of the rainfall captured within the rain garden has infiltrated without ever overflowing into the combined sewer system. As a result, approximately 500,000 gallons of stormwater runoff has been infiltrated on-site. For illustration purposes, the amount of runoff infiltrated equates to a volume of water that would stand 36 feet tall within the footprint of the rain garden. It is also estimated that the successful performance of the rain garden, along with the other stormwater improvements planned for the school, will ultimately save $100,000 in future sewer infrastructure replacement costs within the neighborhood. 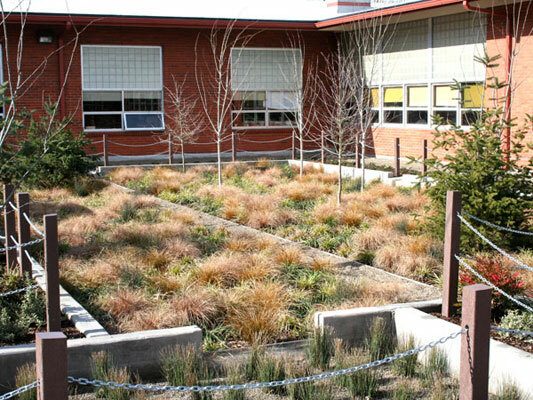 The paramount design challenge for retrofitting the Mount Tabor Middle School Rain Garden was creating simple, cost-effective, and low-maintenance design solutions while still maintaining a well integrated, visually intriguing, and functional site design. Most of the rain garden’s design is predicated on the concept of enhancing the beauty of the site while minimizing future maintenance efforts. For example, the use of a diverse blend of low-growing rushes and sedges within the rain garden not only provides a tapestry of texture and color, but this design approach also allows the occasional weed to grow and blend with the landscape relatively unnoticed, thus reducing the need for intensive maintenance in the future. Another example is the design of a 2-foot wide pea gravel “corridor” that visually connects the rain garden from end to end. Not only does this prominent design feature allow the visitor to observe stormwater cascading into the rain garden from multiple directions, but it also serves as a pathway for maintenance crews to access the rain garden without disturbing the plantings or soil structure. 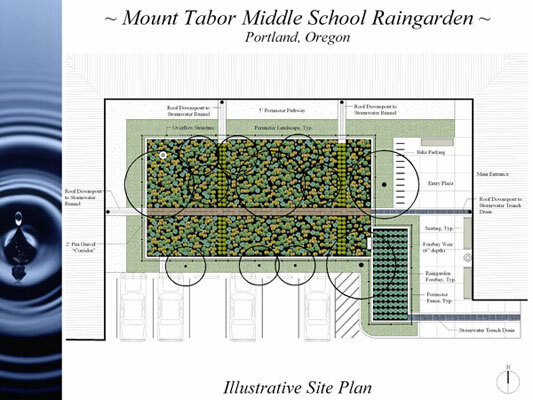 Overall, the design of the Mount Tabor Middle School Rain Garden has met three primary goals: 1) it is low-cost in its design and execution; 2) it benefits the environment and embodies community livability; and 3) it acts a model for other sustainable stormwater retrofit projects. The success of innovative stormwater projects like the Mt. Tabor Middle School Rain Garden is dependent on community partnerships. Representatives from Portland Public Schools, Mount Tabor Middle School, and the local neighborhood were active participants in the project’s design process. Communication with school representatives and the neighborhood continues to this day to determine the overall success of the project from the neighborhood perspective. 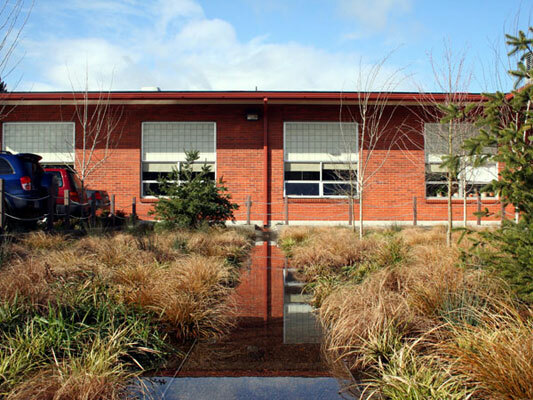 In addition, many school groups throughout the Portland area visit Mount Tabor Middle School to learn about sustainable stormwater management and to take back ideas and inspiration to potentially help retrofit their own school grounds. Despite the fact that the Mt. Tabor Middle School has not even reached its first anniversary, the project has caught the attention of both Portland locals and visitors from all over the United States. The aesthetic appeal and intrigue of the new rain garden has created a community asset that promotes both environmental stewardship and education at the neighborhood level within the urban core of the city.